I wondered sporadically on Saturday on the long drive to see friends up north if I would find a Catholic Church nearby. In the same thought train, I wondered, will I actually get up? I did. Late as usual, I followed my super-smart phone as it directed me there. Parking on the kerb, I thought, this place is big. Walking in, I thought, this place is welcoming. Kneeling in my pew, I prayed. I have been going to Mass since I was, maybe 2, probably 3, in preparation for school and making individual choices, and because there was a hope I would sit relatively still. As the priest walks in, we stand. This Sunday our standing was met with thundering music. Wow. This was different. I am no music aficionado, more a music avocado, but I know what sounds good. This was pop meets rock, where prayer met joy, and people seemed genuinely happy to be at church. I checked. There were a mixture of ages. Those who attend Catholic Services know this in itself is interesting; we are an aging demographic. Not only that, my Irish friends among you, people were singing along. I didn’t even know the songs. Pause music. The priest stands. Do you know the scene from Friends, where Joey explains to Monica that with his presiding over her wedding, she gets a minister and an entertainer a “minitainer”. I met my first. I was concerned. I love the Mass, and I go there to pray and celebrate, to hope and love, not for entertainment. Yet I gave him a chance and this is a man who simply uses excellent people skills to inspire his flock. The first exercise was to introduce yourself to the people around you, and this they did with warmth, smiles and handshakes. I wished I could stay in this parish; as an immigrant Catholic, fitting in is not easy. The media did not overwhelm the message. His question was simple: what can I cut out so that I can do more, give more, be more. “When I quit whining about losing weight, I lost weight” he shared. Wow, a priest who can hit me on many levels. The lay involvement in the Mass was tremendous, beyond the usual collectors, choir and Eucharistic Ministers. There was bake sales and transport people, a couple going to help a community in Mexico, a children’s liturgy, workshops and more. You could tell, more happened than Sunday Mass. At the end, a Minister of the Eucharist spoke about his personal experience in this vocation. I’d never thought of it as a vocation before, until he talked about praying with the old person to whom he is the only visitor, of praying with the family around a deathbed, of helping a lady to the car and eating homemade cookies. I had never thought before of the role these people play in our communities. I, who shout about the importance of citizenship and community involvement, missed the work her own faith community do everyday. I guess I took for granted my Church, and all those in it. I didn’t love it all; their version of Amazing Grace, to me, altered an original that was already perfect. I guess there is no pleasing everyone. I left Mass refreshed, as I always do, and also inspired. When I met my friends, 2 atheists and a something, we talked about the priest’s statement, “when you have more than you need and do nothing to help those who don’t, you are robbing them”. We each had opinions and angles. For the rest of the week, I pondered over what I need to cut out. Tonight I am writing instead of watching TV. A small start but a start. I am reflecting on that Catholic community, the Catholic community in which I was raised and the community I now belong. My faith is based on love, and what I saw on Sunday was the amazing grace of that love in action throughout the community. By the way, we, the 4 of us agreed with the Priest’s statement. It was a simple reminder to do what I love, to be who I love and to surround myself with people that help me to be the person I want to be. One day, I want to have a bench with my name on it. I wonder, what will it say? I was on my way home and decided to walk a different way. Seeing the sign for the river, I took a dander. It was a beautiful day, cold but sunny and a slight breeze was whirling up the fallen leaves. By the river stood 2 benches and I took a seat. The sun was making golden a river bend up ahead, the snow lay on the mountain peaks and the only noises were a bird above me somewhere, the bubbling river, the laughs of a gentleman across the river and traffic crossing the bridge further upstream. I concentrated on stopping and listening, just letting go and enjoying the spontaneous seat by a river. Oddly, my feet did not touch the ground at all. I am shorter than some, but usually my tip toes reach, but here they swung freely, and I felt like a child. Immediately, I wanted to be her. How does one become a living inspiration to all? It sounds a lot better that inspiring after you have gone, which in itself is a sign of a useful life. 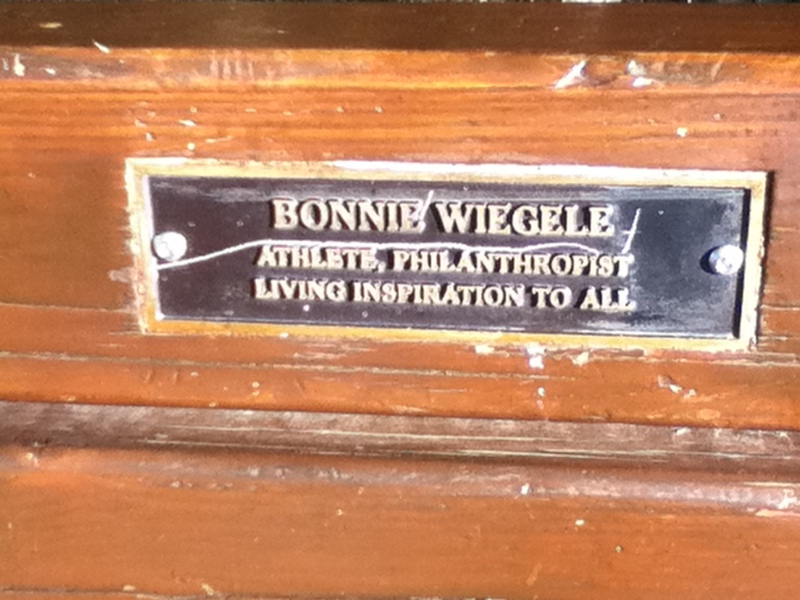 Walking home, I thought on Bonnie Wiegele. Athlete? I wondered did it count that I ran, not fast, sometimes far, but with consistency and with joy. Philanthropist was definitely one I needed to work on so I checked the (online) dictionary as a good starting point. While I do love humanity, I am more empty-handed when it comes to performing charitable actions. Did one have to be a philanthropist to be a living inspiration? How could I practice performing charitable actions regularly? And I realised, by having this inscription on a park bench, this lady, whom I never met, was inspiring me to become a better person. Furthermore, it did not seem out of my grasp. I realised that a living inspiration means, to me, someone who looks at what she values in life and goes about doing it. I may myself be the only person I inspire, and that is ok with me. I took time to think up some things I could do simply to be the person I wanted to be. What did I want my park bench to say about me? Firstly, I bought re-useable bags for my grocery shopping, stopping the conflict in my head over whether I could afford them anymore. I believe in reducing plastic bags and this is the best way I know to do that. Next, I bought free run eggs. They again cost more, but I wanted my eggs to come from happy hens, and while they might not be as happy as the hens my mother keeps at home, they are no doubt happier than being raised stuck in a tiny nest night and day. I decided to do an act of kindness daily, and to put thought into these actions, and I stumbled upon the kindness girl blog to help me. I decided to pay attention to where I put my money. This means trying to become a more ethical shopper and a more generous donator to charity. The ethical shopper is hard and I am only beginning. All advice would be gratefully appreciated as I begin to look at what I spend my money on. Any ideas where to start?